Lakshmi Niwas Mittal (born 15 June 1950) is an Indian steel magnate, based in the United Kingdom. 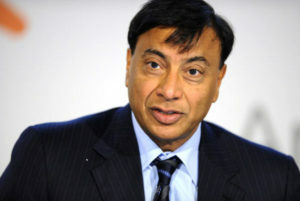 He is the chairman and CEO of ArcelorMittal, the worlds largest steelmaking company. Mittal owns 38% of ArcelorMittal and holds an 11% stake in Queens Park Rangers F.C.. In 2005, Forbes ranked Mittal as the third richest person in the world. In 2007, Mittal was considered to be the richest Asian person in Europe. He was ranked the sixth-richest person in the world by Forbes in 2011, but dropped to 82nd place in March 2015. In spite of the drop, Forbes estimated that he still had a personal wealth of US$16 billion in October 2013.Mukesh Ambani remains the richest Indian, overtaking him, although they have frequently traded places. In 2017, Forbes ranked him as the 56th richest person in the world with a net worth of US$16.4 billion. He is also the “57th-most powerful person” of the 72 individuals named in Forbes’ “Most Powerful People” list for 2015. His daughter Vanisha Mittal‘s wedding was the second-most expensive in recorded history. Mittal has been a member of the board of directors of Goldman Sachs since 2008. He sits on the World Steel Association‘s executive committee, and is a member of the Global CEO Council of the Chinese Peoples Association for Friendship with Foreign Countries, the Foreign Investment Council in Kazakhstan,, the World Economic Forums International Business Council, and the European Round Table of Industrialists.He is also a member of the board of trustees of the Cleveland Clinic. In 2006 The Sunday Times named him “Business Person of 2006”, the Financial Times named him “Person of the Year”, and Time magazine named him “International Newsmaker of the Year 2006”. In 2007, Time magazine included him in their “100 most influential persons in the world“. Mittal studied at Shri Daulatram Nopany Vidyalaya, Calcutta from 1957 to 1964. He graduated from St. Xavier’s College, Calcutta, with a B.Com degree in first class from the University of Calcutta. His father, Mohanlal Mittal, ran a steel business, Nippon Denro Ispat. In 1976, due to the curb of steel production by the Indian government, the 26-year-old Mittal opened his first steel factory PT Ispat Indo in Sidoarjo, East Java, Indonesia. Until the 1990s, the family’s main assets in India were a cold-rolling mill for sheet steels in Nagpur and an alloy steels plant near Pune. Today, the family business, including a large integrated steel plant near Mumbai, is run by his younger brothers Pramod Mittal and Vinod Mittal, but Lakshmi has no connection with it. After witnessing India win only one medal, bronze, in the 2000 Summer Olympics, and one medal, silver, at the 2004 Summer Olympics, Mittal decided to set up Mittal Champions Trust with $9 million to support 10 Indian athletes with world-beating potential. In 2008, Mittal awarded Abhinav Bindra with Rs. 1.5 Crore (Rs. 15 million), for getting India its first individual Olympic gold medal in shooting. Arcelor Mittal also provided steel for the construction of the ArcelorMittal Orbit for the 2012 Summer Olympics. For Comic Relief he matched the money raised (~£1 million) on the celebrity special BBC programme, The Apprentice. In 2003, the Lakshmi Niwas Mittal and Usha Mittal Foundation and the Government of Rajasthan partnered together to establish a university, the LNM Institute of Information Technology (LNMIIT) in Jaipur as an autonomous non-profit organization. In 2009, the Foundation along with Bharatiya Vidya Bhavan founded the Usha Lakshmi Mittal Institute of Management in New Delhi. SNDT Women’s University renamed the Institute of Technology for Women (ITW) as Usha Mittal Institute of Technology after a large donation from the Lakshmi Niwas Mittal Foundation. In 2008 the Mittals made a donation of £15 million to Great Ormond Street Hospital in London, the largest private contribution the hospital had ever received. The donation was used to help fund their new facility, the Mittal Children’s Medical Centre. Mittal successfully employed Marek Dochnal‘s consultancy to influence Polish officials in the privatization of PHS steel group, which was Poland’s largest. Dochnal was later arrested for bribing Polish officials on behalf of Russian agents in a separate affair. In 2007, the Polish government said it wanted to renegotiate the 2004 sale to Arcelor Mittal. Employees of Mittal have accused him of “slave labour” conditions after multiple fatalities in his mines. During December 2004, twenty-three miners died in explosions in his mines in Kazakhstan caused by faulty gas detectors. Blair’s letter hinted that the privatisation of the firm and sale to Mittal might help smooth the way for Romania’s entry into the European Union. It also had a passage, removed just prior to Blair’s signing of it, describing Mittal as “a friend”. Mittal had emerged as a leading contender to buy and sell Barclays Premiership clubs Wigan and Everton. However, on 20 December 2007 it was announced that the Mittal family had purchased a 20 percent shareholding in Queens Park Rangers football club joining Flavio Briatore and Mittal’s friend Bernie Ecclestone. As part of the investment Mittal’s son-in-law, Amit Bhatia, took a place on the board of directors. The combined investment in the struggling club sparked suggestions that Mittal might be looking to join the growing ranks of wealthy individuals investing heavily in English football and emulating similar benefactors such as Roman Abramovich. On 19 February 2010, Briatore resigned as QPR chairman, and sold further shares in the club to Ecclestone, making Ecclestone the single largest shareholder. Mittal purchased the Irish Steel plant based in Cork, Ireland, from the government for a nominal fee of £1 million. Three years later, in 2001, it was closed, leaving 400 people redundant. Subsequent environmental issues at the site have been a cause for criticism. The government tried to sue in the High Court to have him pay for the clean-up of Cork Harbour but failed. The clean up was expected to cost 70 million. In 2014, Mittal denied that there was any truth in the rumour that he made a bid to buy “Blencathra” mountain lying in Northern fells mountain range in Britain‘s Lake district. Mittal’s residence, 1819, Kensington Palace Gardens, London. Mittal was born on 15 June 1950 in Sadulpur, Rajasthan. He is married to Usha Mittal. They have a son Aditya Mittal and a daughter Vanisha Mittal. Lakshmi Mittal has two brothers, Pramod Mittal and Vinod Mittal, and a sister, Seema Lohia, who married Indonesian businessman, Sri Prakash Lohia. His residence at 18-19 Kensington Palace Gardenswhich was purchased from Formula One boss Bernie Ecclestone in 2004 for £67 million (US$128 million)made it the world’s most expensive house at the time. The house is decorated with marble taken from the same quarry that supplied the Taj Mahal. The extravagant show of wealth has been referred to as the “Taj Mittal”. It has 12 bedrooms, an indoor pool, Turkish baths and parking for 20 cars. He is a lacto-vegetarian. Mittal bought No. 9A Palace Greens, Kensington Gardens, formerly the Philippines Embassy, for £70 million in 2008 for his daughter Vanisha Mittal who is married to Amit Bhatia, a businessman and philanthropist. Mittal threw a lavish “vegetarian reception” for Vanisha in the Palace of Versailles, France. Mittal owns three prime properties collectively worth £500 million on “Billionaire’s Row” at Kensington Palace Gardens. In 2005, he also bought a colonial bungalow for $30 million at No. 22, Dr APJ Abdul Kalam Road, New Delhi, one of the most exclusive streets in India, occupied by embassies and billionaires, and rebuilt it as a house. In December 2013, Mittal’s niece Shrishti Mittal got married in a three-day celebration that is said to have brought Barcelona to a standstill and cost up to £50m. Some 200 butlers, cooks and secretaries were reportedly flown into Spain from India and Thailand while the 500 guests were made to sign confidentiality agreements. According to the Sunday Times Rich List 2016, Mittal and his family had an estimated personal net worth of GB£7.12 billion, a decrease of $2.08 billion on the previous year. Meanwhile, in 2016 Forbes magazine’s annual billionaires list assessed estimated Mittal’s wealth in 2016 at as the 135th-wealthiest billionaire with a net worth of US$8.4 billion. Mittal’s net worth peaked in 2008, assessed by The Sunday Times at GB£27.70 billion, and by Forbes at US$45.0 billion, and rated as the fourth-wealthiest individual in the world. Tim Bouquet and Byron Ousey – Cold Steel (Little, Brown, 2008). Yogesh Chabria – Invest The Happionaire Way (CNBC – Network18, 2008). Navalpreet Rangi–Documentary Film (The Man With A Mission, 2010).